Second Effects: Blogger's Party, April 2008! The event was held at Tymmerie's Girl Wonderful Land Estate, set up in an outdoorsy manner, complete with beach. 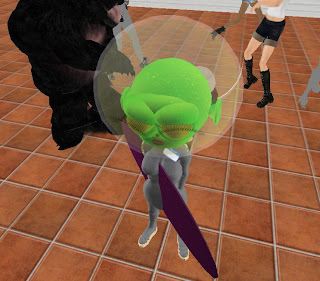 I'd say around 50 avatars attended, although not all at the same time. 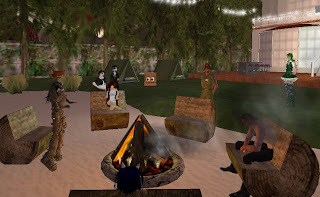 Like many events in SL, it's hard to get everyone in one place due to time zones, other commitments, and of course something called "Real Life". The most noticable costume was Jerremy Darwin's bear. Yes, he growled. Frequently. Yes, there were Greenies present! Two, in fact. 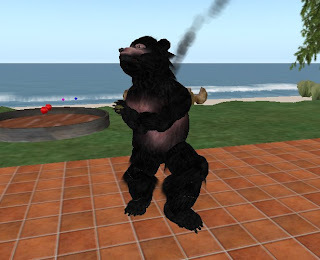 Later, an unnamed blogger admitted to never having seen the Greenies sim! Shame! As promised the chocolate-wrestling grudge match took place between host Tymmerie Thorne and Willow Caldera. The winner on this day... Willow! Soon after, the crowd insisted on an epic challenge: Vint Falken vs. Crap Mariner in the chocolate wrestling tub! After some quick training (TheDiva: "Just hit the UP arrow a lot") the competitors were ready (apologies for the gray pics, guys!) There was no doubt who won this match: Vint was able to pin Crap in short order. As the partygoers began to disperse, the stragglers descended on the beach campfire area. A cozy area it was, and the conversation got less silly and more serious, with the bloggers discussing important issues of the day. Here we see TheDiva, GoSpeed Racer, Crap Mariner, myself and others. Crap was mostly silent, but occasionally flew upside down. 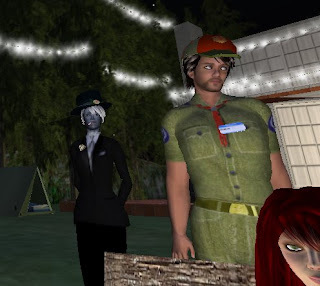 I think my outfit adhered a little bit more closely with the "camping" theme of the event. What's with this picture? I am not sure, but for some reason I like it a lot! The stay-waaay-past-the-end stragglers are pictured here, Vint, Crap and myself. Even Tymmerie, our host for the event had left at this point. What a way to end the day: getting your weenie roasted by Vint!